When people come into the wine store I work at around this time of year, more often than not they’re looking for something crisp, white, and refreshing. Maybe they don’t know what they’re in the mood for beyond that. Maybe it’s a group divided between Sauvignon Blanc drinkers and Chardonnay drinkers, not knowing how to split the difference. Maybe they’re not quite sure what they’ll be eating with it, but they know they want a white wine. Chances are that if you come ask me for a recommendation, I’ll offer up a bottle of Albariño as an option. It happens to be among my personal favorite summertime grapes. Albariño also fits so many different scenarios. It’s sooooooo refreshing on its own as a “porch sipper,” but most versions also work well with a wide variety of foods. It’s naturally high in acidity, which is typically balanced by a plump peachiness, complemented by lots of saline minerality. Thanks to that bit of body up front that’s backed up by a minerally finish, I find that Albariños tend to please a lot of different palates. It will also entice your nose to the glass, as it’s pretty aromatic with lots of stone fruit notes, citrus, honeysuckle, and stones. You can bet this grape is perfect complement to seafood, but really with so much more as well. The grape hails from the north west Atlantic coast of the Iberian Peninsula and is a key player in the wines of Rías Baixas in Spain and Vinho Verde in Portugal. It’s unclear in which of these two areas it originated, but they’re in the same neighborhood. Albariño’s Spainish home of Rías Baixas is very different from most of the rest of the country. Right on the Atlantic coast, it’s much cooler, wetter, foggier, and much greener than most of the rest of the county. Luckily, Albariño, the region’s signature grape (it must make up 70% of the blend) does well here thanks to its thick skin, which helps it stand up to all the humidity. The cooling ocean influences also help the grapes retain the crisp, mouth-watering acidity that’s emblematic of the regional style. 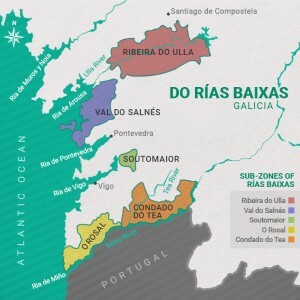 Map of Rías Baixas and its sub-zones courtesy of Rías Baixas Wines. The region and the grape are probably best known for making a crisp, refreshing light wines, but it can definitely be made in fuller styles as well. It can be matured in oak, and is increasingly aged for several years in stainless steel tanks before release. Lees aging can also add texture and richness. It can age when given the chance, but it’s just so tasty when young that it’s hard to make a convincing argument for waiting. Galicia is steeped with history. Winemaking in the region dates back about 2,000 years, but it’s better known as the final stop on the Camino de Santiago. The 500-mile Christian pilgrimage ends at the Cathedral of Santiago de Compostela, where the remains of St. James are buried. The area has only become known for wine in more recent years as it received its Denomination of Origin status in 1988 following Spain’s entrance into the European Union. If there is one downside to this grape it’s that the secret is out on Albariño. Rías Baixas has become increasingly popular in its short time span as a D.O. Sadly for the consumer, this has also caused prices to rise. Not to worry though! There are still plenty of delicious and wallet friendly versions to be found! Additionally, its popularity has given rise to interest in the grape in many New World regions as well. I decided to open a bottle of Adegas Gran Vinum Nessa Albariño Rías Baixas 2016 one evening right smack in the middle of Albariño days. The Piñeiro Cores family are the makers of this wine. They’ve been involved in making wines for many generations, however, getting their vineyards in top shape to make their wines took some time. They first brought together fragmented vineyard plots, then they slowly went about replacing the hybrid varieties originally on the land with Albariño. They finally launched Adegas Gran Vinum in 2002. Their holdings include 8 acres of vineyards, which they supplement with grapes from other local growers with whom they have close relationships. The vineyards are fertilized with clam and cockle shells and are carefully tended. To keep the vines from getting too soggy in the region’s extremely wet conditions, the Galician tradition is to use long stone posts to elevate the vines off the ground–which has the added benefit of looking quite pretty! The wine has a really pleasant tang. Greg and I picked up the characteristic peachiness on nose, along with a bit of brine, white flowers, and a faint touch of earthiness in the vein of fresh hay. The fruit on the palate became a little more tropical with crisp pineapple, tangerine white peach and a squirt of lemon. There were also some savory herbs in the mix–nori that blended in with the sea breezy briny quality. The wine had bright, high acidity, and the wine’s body was on the lighter end of medium. I had a hankering for fish and chips, and I thought this wine would be delicious with fried seafood. What resulted was a spin with light Spanish and Japanese touches. Cod fillets were battered in tempura spiked with smoked paprika. Rather than fries, I decided to roast baby potatoes in varied colors that also got a touch of paprika. These all went on a simple salad with quick pickled red onions that brought in a perky kick. To tease out that faint nori note, I sprinkled on some furikake – a Japanese seasoning that includes seaweed flakes and sesame seeds. Some friends introduced me to furikake a few years ago and it has been a staple in our pantry ever since. Variations can include a breadth of additional flavorings like yuzu or bonito. If I hadn’t had the furikake on hand, I would have brought in some capers for their briny/floral notes. Furikake is great on seafood, rice, and on eggs in the morning. 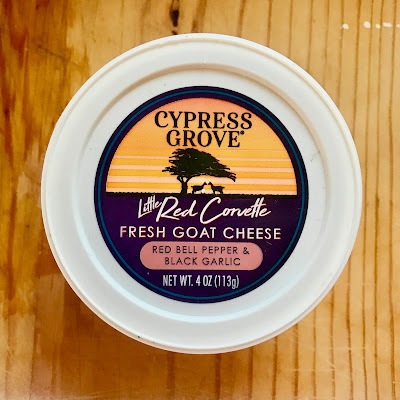 Not strictly speaking a part of the recipe, but we also ended up trying this Little Red Corvette red pepper and black garlic goat cheese spread from Cypress Grove, and it made a really nice, creamy addition. Samples work! I got a taste of this at my local Whole Foods and I couldn't resist buying one. It made a tasty add-on. This all worked so well together! 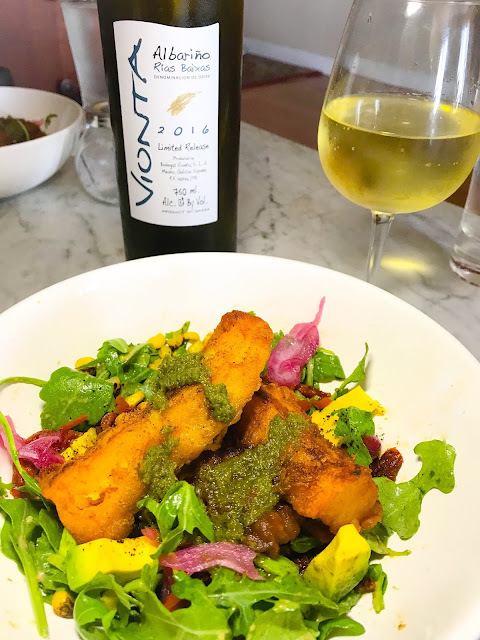 The wine was lovely match with the fried fish balanced the richness of the fried batter and the potatoes.Vinegar can be tricky to pair because it can make many wines to taste flat. It worked well here in the pickled red onions and in the salad because this wine had enough acidity to hold up alongside the vinegar. It became fruitier next to vinegary bites, while still remaining bright. The furikake played right along bringing out the briny and the umami-nori touch in the wine. YUM! At a SRP of $17, this makes a great House Wine. 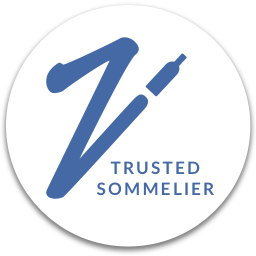 Find on here wine-searcher.com . I made more cod tempura than we needed for one dinner for the two of us. The next day I used the leftover fish on a second salad for lunch. I re-crisped up the fish in the toaster oven. This time I added avocado, crispy onions, and salsa verde, which all also worked quite well. The Vionta Albariño Rías Baixas 2016 (also a sample, SRP $16, or find on wine-sercher.com) tended more to the minerally end of the spectrum. It was citrus driven, crisp and refreshing with some added leesy texture. I sometimes teach a Spanish wines and tapas class during which I typically pair a wine from Rías Baixas with a super simple tapa of roasted red pepper stuffed olive wrapped in an anchovy. It takes only a few minutes and it always works really well. For other wine options, I’d recommend Vinho Verde from Portugal or Txakolina from Spain’s Basque region for alternatives with similar attributes. Muscadet and Chablis would also bring notes of briny minerality and crisp acidity. Carboniste Gomes Vineyard Albaniño 2017 – traditional method Sparkling from here in CA. LOVE. Quinta de Soalheiro Alvarinho Vinho Verde Portugal. 8 & 20: Smoky Paprika Shrimp With Saffron-Lemon Pilaf – One of my favorite 8 & 20’s that I’ve made! 2. Place the sliced onions in a bowl and cover with the red wine vinegar and the Tbsp salt. Set aside. This will make more red onions quick pickles than needed for this recipe, so keep additional onions for another use. 3. Toss the potatoes with a generous pinch of salt, about ¼ tsp smoked paprika and a drizzle of olive oil. Place in the oven and roast for 30 to 40 minutes (depending on how browned you like the potatoes–I tend to like them quite browned), tossing them halfway through. 4. In a large bowl, toss arugula with olive oil, vinegar, salt, and pepper. Keep cool until ready to serve. 5. Whisk together the tempura batter with a generous pinch of salt and remaining ¼ -½ tsp of the smoked paprika, depending on how intense you want the flavor. Mix together with ⅔ cup to ¾ cup cold water, adding it gradually until you reach a desired thickness. Set the bowl on ice or in the refrigerator until read to use. 6. Pour oil in a deep fryer or in a skillet so that it comes up at least an each deep. Heat to approximately 350°F. 7. Pat the fish dry then dip the pieces of fish in the batter. Add to the oil and deep-fry until golden brown, make sure not to overcrowd the pan. As you remove the fish pieces from the pan, transfer them to a plate lined with paper towels and sprinkle salt and pepper. 8. 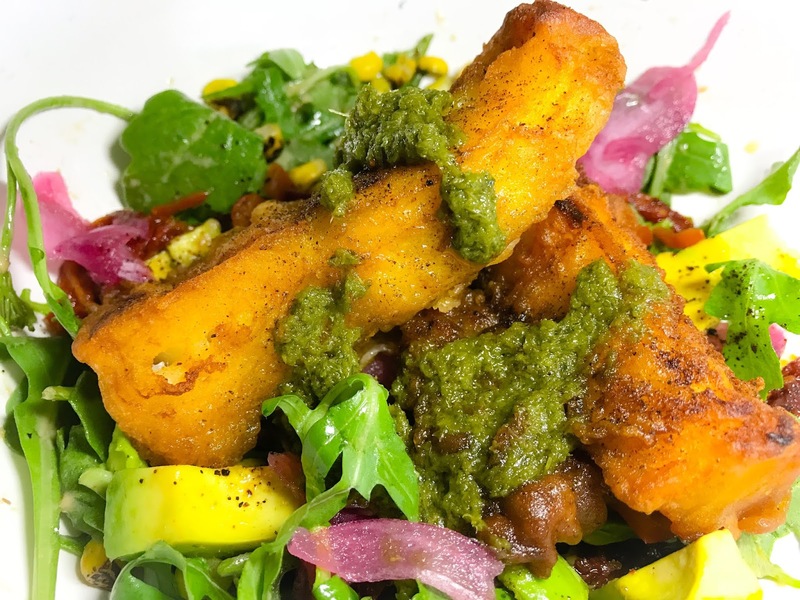 Arrange arugula on each plate topped with some of the red onion quick pickles and roasted potatoes. Place portions of fish on each plate, sprinkle with furikake, and serve. And check out Wine Lover’s Guide to Galicia, Spain on Fodor’s travel for more on the region. Thanks for all the wine recommendations... All the pairings sound amazing. I love your idea for fish and chips - especially a sprinkle of paprika on top. 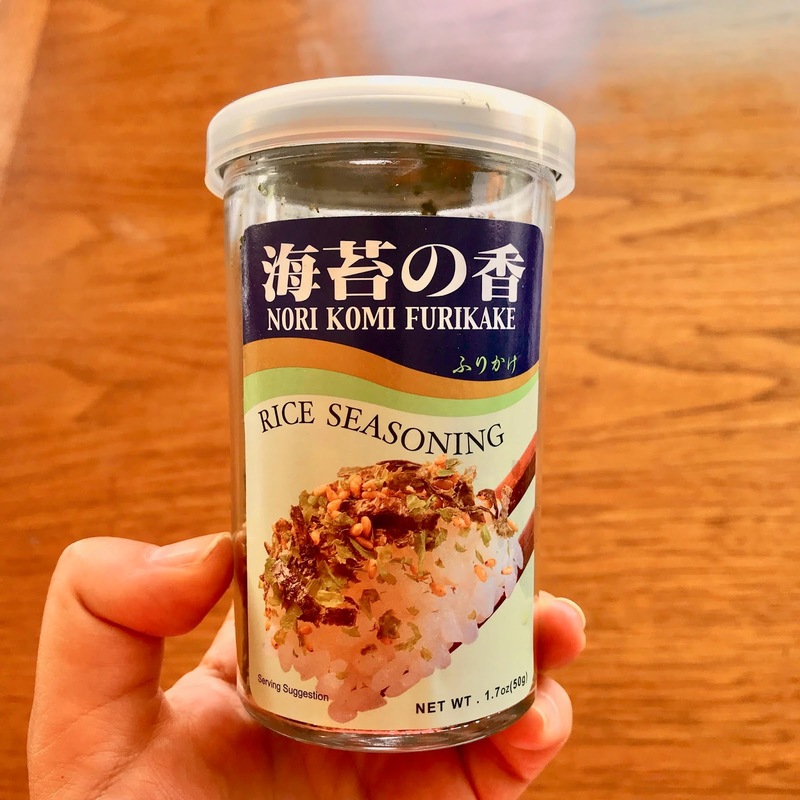 The furikake seasoning is new to me but I'm on the hunt for it now. Thanks for another delicious dinner idea for my husband and me to try! agree 100% one of the things I love about Albarino is that it is so diverse. Can handle itself with a variety of food, but also is great as a stand alone sipper!